Knitting Pipeline: Episode 125 Picker or Thrower? Episode 125 Picker or Thrower? Listen here or use the Flash Player in the side bar. (Unfortunately not very compatible with Internet Explorer browser). Subscribe on iTunes! This episode is sponsored by my Longaberger Home Business, Quince & Co, and Klose Knit. Fine Fibers and Friendly Service is the motto of Klose Knit and that is exactly what you’ll find in our store in Urbana IL. We have a great selection of yarns including Rowan yarns and patterns, Blue Sky Alpacas, Art Yarns, Tahki, Dream in Color, and not to forget the complete Malabrigo line which is our best selling yarn. 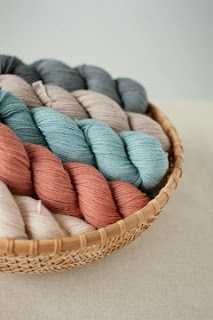 Several smaller yarn producing companies like Zealana, Jojo Land, Jade Sapphire and numerous sock yarns you will find on our ever growing shelves. Sock yarns include Opal, Austermann Step, Trekking, Paca Peds; the list is forever growing and changing. Klose Knit is a quick hop off the I-74 in the heart of Urbana IL. 311 W. Springfield Ave.
Urbana, Illinois 61801 (across from Strawberry Fields). Brigitte, owner of Klose Knit, in one of her rooms full of delightful yarn selections. One of many shop samples at Klose Knit. You can find my Longaberger Home Business at www.longaberger.com/paula. Please contact me if you would like to be on my preferred customer email list. It made me so happy to hear you talk about Helen Keller. I will never forget reading a biography of her as a young girl and then watching The Miracle Worker. I had heard about Helen Keller my entire life because my mother grew up near Tuscumbia, AL. In fact my mother and I just drove past the Keller home a few weeks ago when we were visiting a relative there. My great grandmother, Minnie Burns Lindsay Nathan, and her sisters were friends with Helen Keller. Another thing I find interesting is that our daughter said that all of her students in rural China had learned about Helen Keller in school - that she is considered by the Chinese to be a hero. Well, this message is way too long but I just wanted to pass on our story. I will try to attach a picture of my mother as a little girl. I think Helen was right! 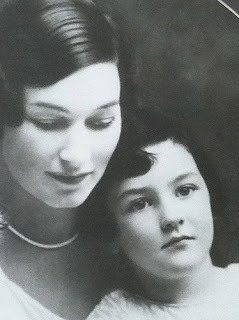 Missy's mother as a child, with her mother. Beautiful! Scroll down the page. Towards the bottom you will see the (smallish) Buy Now button, with a box ABOVE it for a discount code. After entering the code and clicking on the Buy Now symbol, you will be taken to PayPal, where they will see the discounted price. If you have any problems, they can e-mail me via the Contact page on my blog, easyknittingdesign.com. Knitting Pipeline Retreat April 26-27, 2013 with Yarn Crawl Fun Day on April 25th. Join in the yarn crawl at any time or go at your own pace and schedule! Aizome and Susanna are going to collect Mother Bears to take back to Minnesota. $3 per bear. Gill’s Rock KAL March 8 through April 9. Gills’ Rock Project Worksheet by Joyce Garris of After This Row. Free for a limited time! Wave 1 March 8 through April 8. Wave 2 April 8 through April 30th. Prizes! Quince & Co yarn. Waves of Blackbirds, hawks, and swans. March came in like a pride of lions. I sewed the buttons on my Acer Cardigan so it is officially finished. I will try to get a photo of me wearing it this weekend. Just was listening to the podcast, and had a thought. You said it’s hard to estimate the size of a buttonhole in advance, which makes it hard to select buttons. That’s true -- even if it’s say, 4 stitches wide, it does seem to stretch a bit. So the solution is: (wait for it) Swatch! Just work a buttonhole in your gauge swatch and you’ll know where you stand. In the patterns I write, I give the size of the buttons required and I write the buttonhole instructions so that they will match. Of course you might want to adjust that if you already have buttons you want to use. Actually I did swatch for the buttonholes but I had forgotten about that. In Paula Ward’s e-book she had a tip about testing for your button band pick up rate on the side of your gauge swatch. This is one of many tips in Paula’s book (in which I have no vested interest I might add). So I did that on both sides of my swatch and I worked a few buttonholes in that too. Good point, Brenda. Is grograin ribbing backing a necessity on button bands? I do use backing buttons. I am going against the current here but I don’t use the grosgrain ribbon. I am from the Elizabeth Zimmermann School of Thought on that one. Don’t forget to look through your old counted cross stitch thread from the 80’s for thread for sewing on buttons. I found a perfect match for these green buttons. He’s 4 and a half months old. So what’s an auntie to do when the poor child has outgrown his handknits? Ribbed Jacket by Debbie Bliss was one I knitted for the baby shower last July. On cover of Special Knits: 22 Gorgeous Handknits for Babies and Toddlers. $25 © 2005 Trafalgear Square Books. Shown in pink on cover and in book but really is gender friendly. Lots of boy sweaters on Ravelry. This was my first time using Knit Picks Brava and I was impressed. It is the best acrylic I’ve found. (Please forgive me EZ) Everything for this baby needs to be washer and dryer safe. This is a worsted instead of Aran so that might account for the small size. Some of my changes are in my project notes. Might try to pull this one off again in larger size, then again, maybe not. I sent in suggestion for name “Old World Charm Baby Blanket” Not the best name but better than b18-30. Agree? This is a beautiful pattern. Although not difficult the directions assume you are experienced so I am rating it as medium difficulty. Once you get the pattern established it is tv or social knitting. Knitted in worsted weight rather than DK this would probably be a better size. Pattern was a gift from Jan Smiley. Thank you Jan! Quick, easy, fun pattern. The paid version has lots of variations which I plan to do someday. For this one I went with the basic/original version. I've added a dozen or so squares from Pipeliners: Auntea, NanaElliott, PinkShawlGirl, dpeach, and Qwiltnknitnut. Thank you to Jane Miller for article in Peoria Journal Star. I did say that continental knitting is faster for me. I know that English or Right handed knitters can be very fast but for me, continental knitting is faster. This relates to a question this week from Bird Nerd Knitter who asked what we mean by “throwing” vs “picking”. I think of it this way. When you pick the yarn you essentially use the needle to grasp the yarn and pull it through the stitch. When you throw the yarn you use the finger to move the yarn. I do have a You Tube video that shows how I knit continental. It was done before I figured out how to focus for video but you will get the idea. The main difference is that in picking the needle is doing the work. In throwing a finger does the work. There will generally be less movement with picking rather than throwing. I played a funeral with other pipes and drummers for a firefighter in Bloomington IL who was killed while on a call. Today I played a funeral in Cuba IL. What an outstanding episode, and thank you so much for these show notes especially the dear photo of Missy's mother with her mother. What beautiful women, what a touching story. And I think we can see Missy's face there too, can't we? And speaking of faces - your nephew's wife and Susan B Anderson....know it's been said before, but OMG they are so similar. Happy St Patrick's Day! Loved the show. I've been stuck in the house with a cold (and my crafting) and appreciate the news and new ideas. I was recruited to act in the Miracle Worker, but was too tall for Helen. It was still a good experience. I wonder how many of your listeners share this experience? I am embarrassed how brilliant the simple switching ideas are, and that I never thought of them. But that's the sign of a really good idea. I share your dismay with Debbie Bliss (Grief). Like trendy clothes and spicy foods, I am drawn to her and its usually a mistake. Maybe I should knit the sweater from the picture with my new design book. Thanks for the links. All kinds of ordinary people stand on the overpasses and pay their respects as the fallen soldier's remains are driven to the coroner. Highway 401, outside of Toronto. I'm from B.C., on the other side of Canada. Love your podcast!